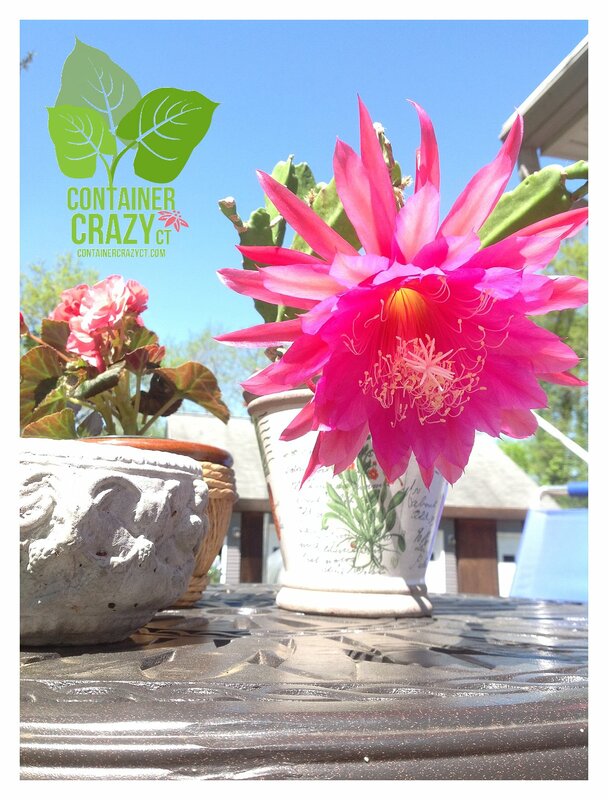 I’ve been so busy preparing for this weekend’s class on Container Gardening with succulents, alpines, and cacti that I woke up at 2:00 am unable to sleep. The excitement is getting to me, as it always does. So, after tossing around in bed for another couple hours, I gave up and got up. 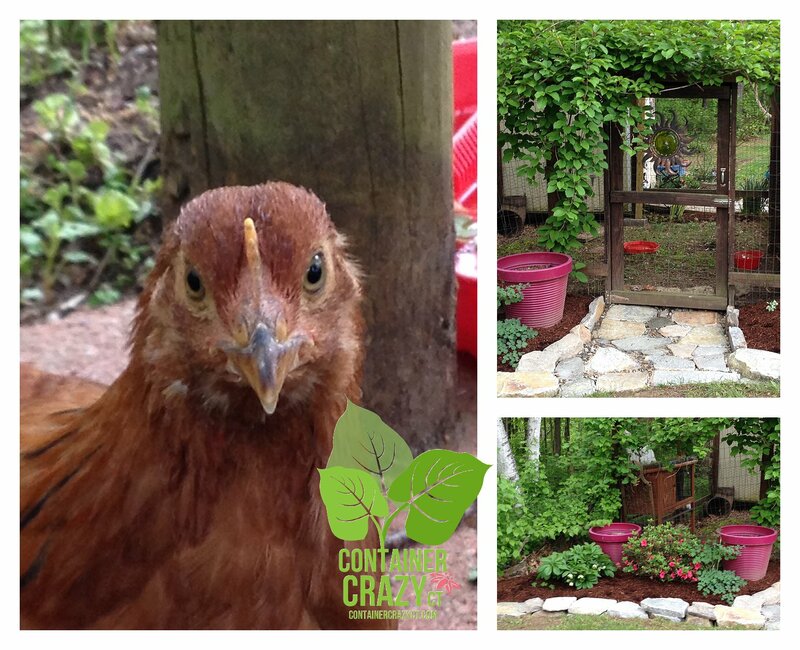 I decided a distraction may be in order, so to continue my trend, I’m posting some general photos I took around my home, and here or there, related to gardening – and chickens – yes, have those now and we are enjoying our six hens. On a clear day last weekend, I took this plant outside to take some photos of its amazing bloom. And geesh, is this not stunning? I love the hot pink color against the clear blue sky. Why haven’t I had one of these plants before? I plan to research and blog about in detail later. Do you have one or grow these? If yes, I would love to hear from you. 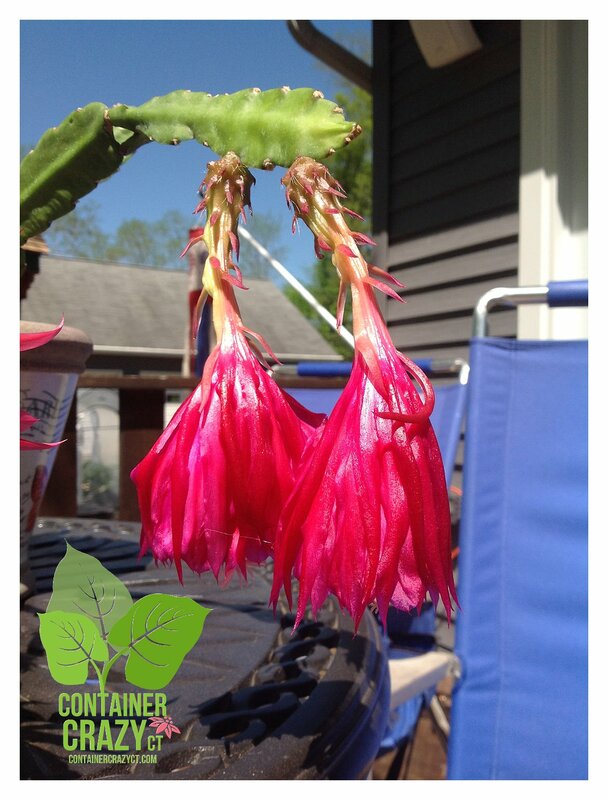 The bottom photo is of two closed up blooms that finished their show. Can you guess what this plant is? 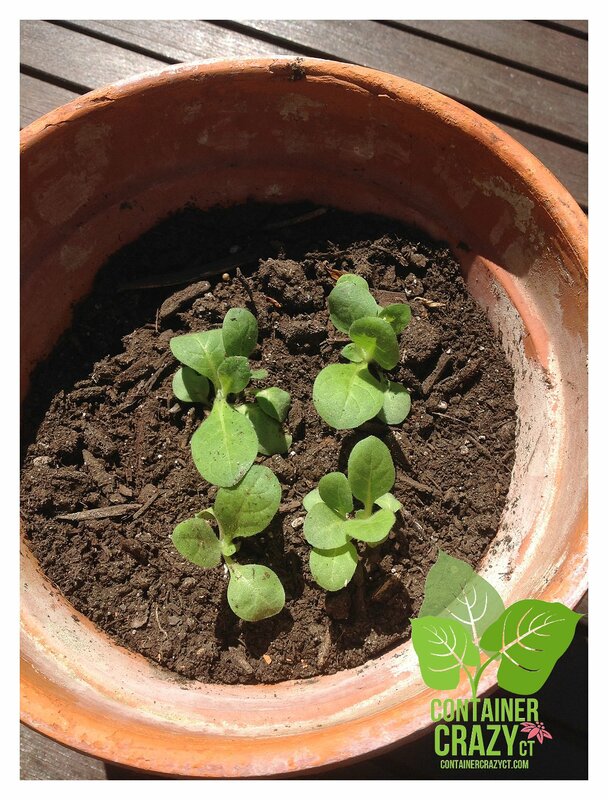 As noted, they are tobacco plant seedlings. Last summer, I asked a nearby grower of these if I could have one plant. His response, well, no, I can’t give any away. I wanted to remind him of the day his big cows came into my yard and rubbed against my Arborvitae trees many years back, and how I didn’t complain – Why? Because I grew up on a farm and have an appreciation of how cows can get free, running loose from time to time. But his cows did major damage, so I tore the trees out without much of a word about it and moo’ed on. Well, last winter, I happen to mention this story to a friend, and this spring, she text me to say she got me some seedlings of tobacco plants from a farmer friend of her’s, and she even dropped them off for me in this pot. I thought, what an amazing gesture on her part. Why, you wonder, would I want one of these? Well, they grow fast, have large showy leaves, and I just want to experiment with it for the features. Will let you know how it goes, it is time to prick these out and get them into individual pots. I finally got my first Japanese Tree Peony (Paeonis suff. ‘High Noon’) and I couldn’t be more thrilled with its show. The yellow blooms are luxurious. 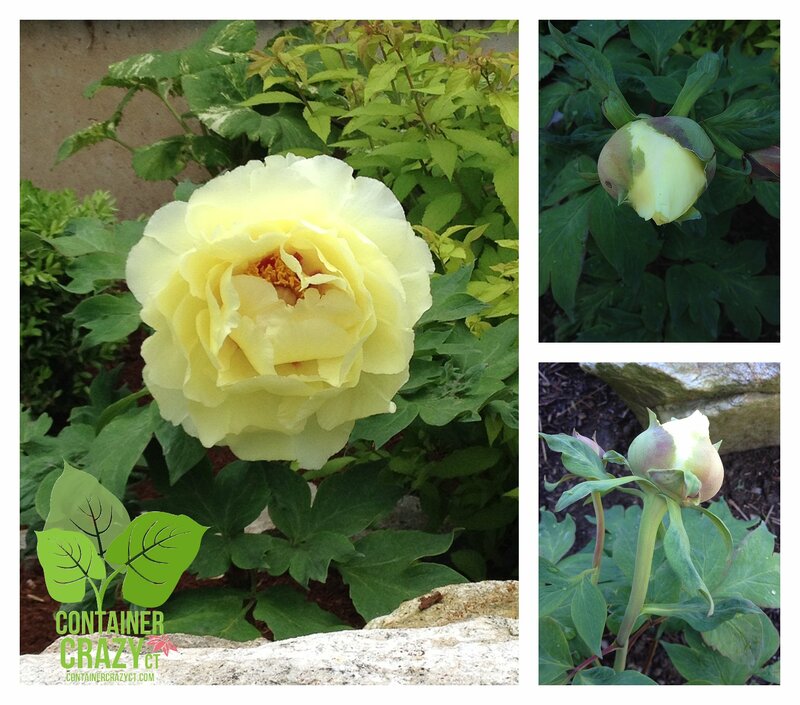 This one has an exceptional yellow flower and they are the double type which I prefer on Peony plants. As the afternoon sun hits it, I just ooze over it. 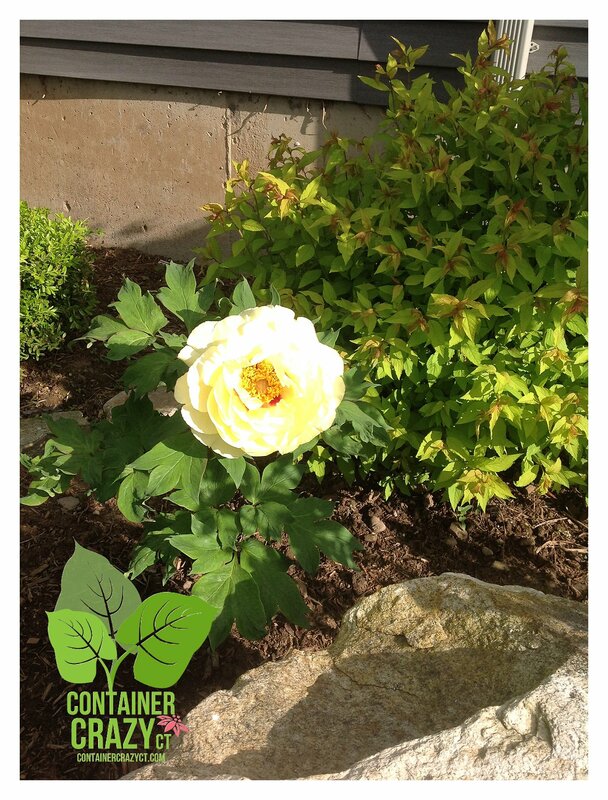 It will grow to 48″ tall and is for Zones 4-8. It was a little pricey, but worth it. For those of you who do not know, these have a wood based stem and look more like a shrub when mature. I planted a tall bearded Iris with honeysuckle and chocolate mint plants, one of each type in two large container gardens for a business client. Imagine the scents in this arrangement? The honeysuckle is Lonicera x heckrottii ‘Gold Flame’, a perennial with a vine and shrub like habit. It is super fragrant with deep magenta blooms appearing in late spring through early fall. It takes sun to part shade and I think the color looks spectacular with the blue blooms of the Iris ‘Abiqua Falls’. Ironically, I stopped at a local garden center this past weekend, and one of the owners told me someone had asked her recently what was in these planters – thinking her store planted them. (Note to self: I have to get my sign in these containers!) I don’t like the look of a sign poking out of the containers, one of the reasons I haven’t done so yet. 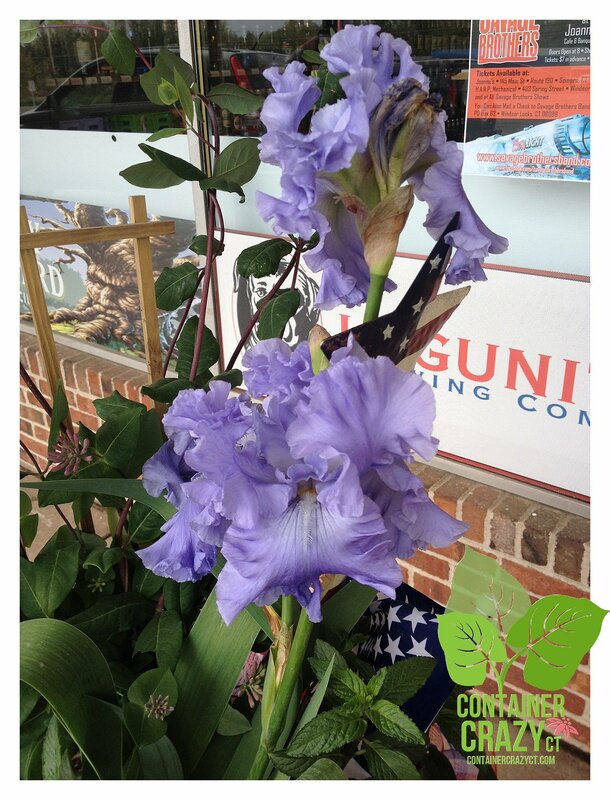 Oh, the Iris is an award winner, prized for its large, sky blue blossoms. The only problem with using Irises is they toppled over a bit, but luckily the trellis helped to anchor them back up. 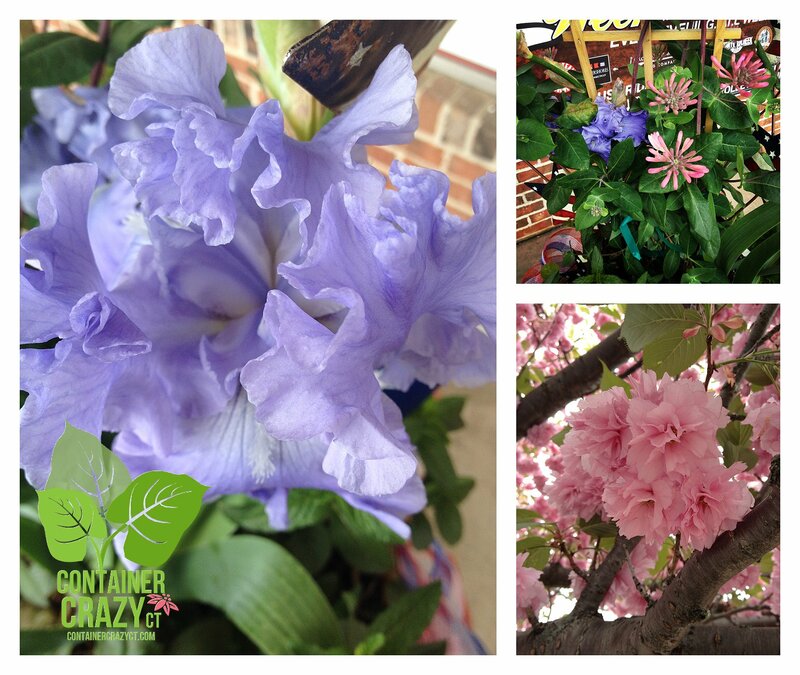 In the bottom right photo is a Kwanzan cherry tree’s blooms which I took a photo of while on the road the same week as stopping in to check on these two container gardens. Taking a break from the flowers – I also wanted to show a handy cart I ordered, which folds up super easily. It can hold a lot of items and rolls really well too. For years, when I would go to a Container Garden Party to do my classes or for talks at garden clubs, I lugged heavy items into the building practically by hand. This wagon so helped me this past Monday when I did a talk at the Vernon Garden Club on incorporating edibles into container gardens. It folds in a snap and goes right into the back bed of my truck. Love it! I was trying to get a photo of this bee – but it came out a bit blurry. This is a perennial I get CRS on every spring. I mix up the name sometimes with Polemonium which is similar but not quite. However, I love my Polygonatums on the north side of my house in a shade area. Their long and graceful arching stems are eloquent. I divided up some and moved them to appear in batches in the bed and this year they look really great. 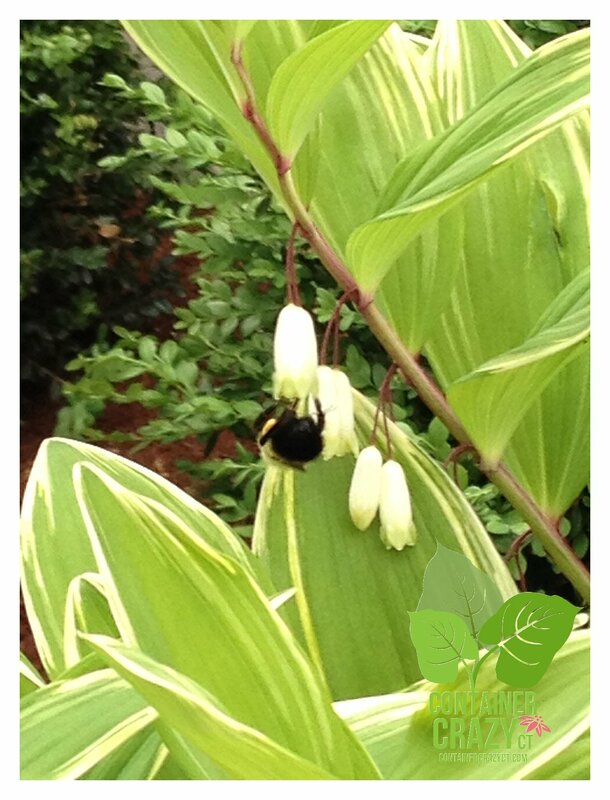 This makes a great woodland plant too and the dangling flowers are serving the bees coming by. The foliage on this variegated one is very pretty, painted white on the edges. This perennial prefers good moisture too. 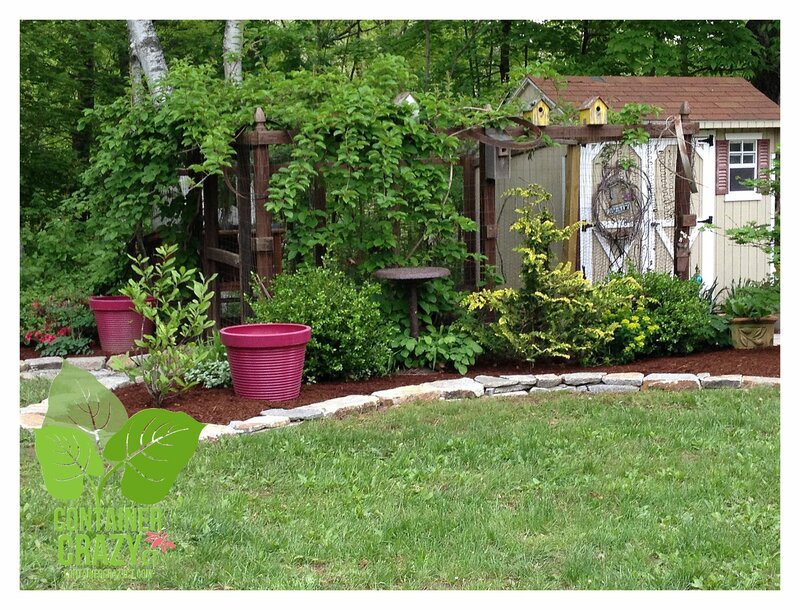 For years, I wanted to edge the area around my chicken coop – and my friendly landscape installer connection, Chris of Outdoor Creations of Ellington, obliged my request to have it done in time for this weekend. I am thrilled with how it came out. 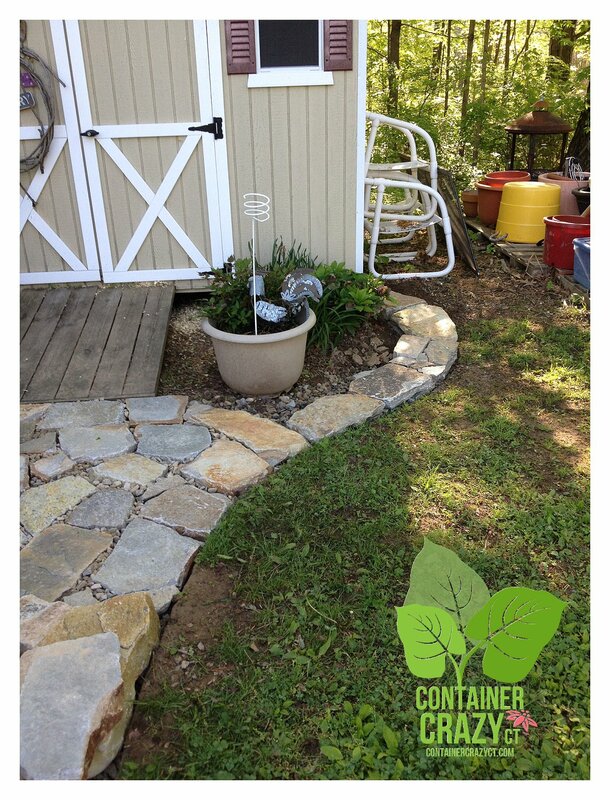 I like the natural look of this type of stone, and now I can have fun fixing up my plantings and adding perennials and container gardens to this area. Talk about spoiled chickens! Not only is their surrounding enhanced, they were fed grubs and worms by Chris as he was working on the building of the edge and mulching the beds. He said they were fun to watch, and I’m sure they enjoyed his company while he was here. Sparkles, the recently named chicken, agrees. She’s the boss of my six Rhode Island Red hens, seen in the photo below. Two kiwi vines, plants several years ago, a male and female plant on each side as required for pollination, are above my pen area of the coop. One day, Sparkles was jumping up to grab some leaves. 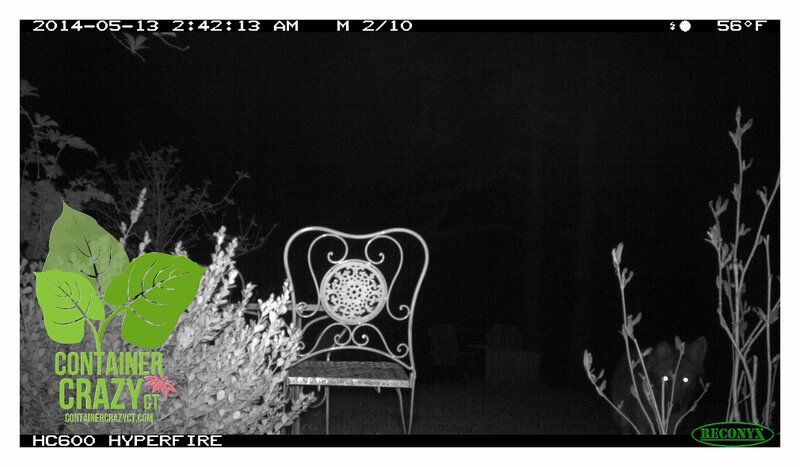 We caught her on our motion censor camera which we move around the house to capture photos of wild life – and predators, as you will see following this photo. Look at Sparkle’s feet – she jumped right off the ground. My first priority was to determine if this vine could be poisonous to the chickens, and thankfully, it is not. They get a feeding of them every day now when I go visit, tearing some leaves off to toss down for them. And, I think this will be the year we finally get kiwi fruit from these vines. I saw tiny buds on one plant, the female plant. It takes about five years for them to bloom and produce fruit – so we will see. The vines require a great deal of pruning to keep in check, it can overtake anything, and grows fast. We removed branches off a tree above the pen area last year because the vines were twining up to it, so it has to be watched. Feeding some leaves to the chickens will help, I think. As I have mentioned, we attempted chicken raising here twice before, and gave up for a couple years. The former chickens were allowed to free range, and got snatched by foxs, hawks – you name it. But our new ones will not go beyond their protected coop and outdoor pen. 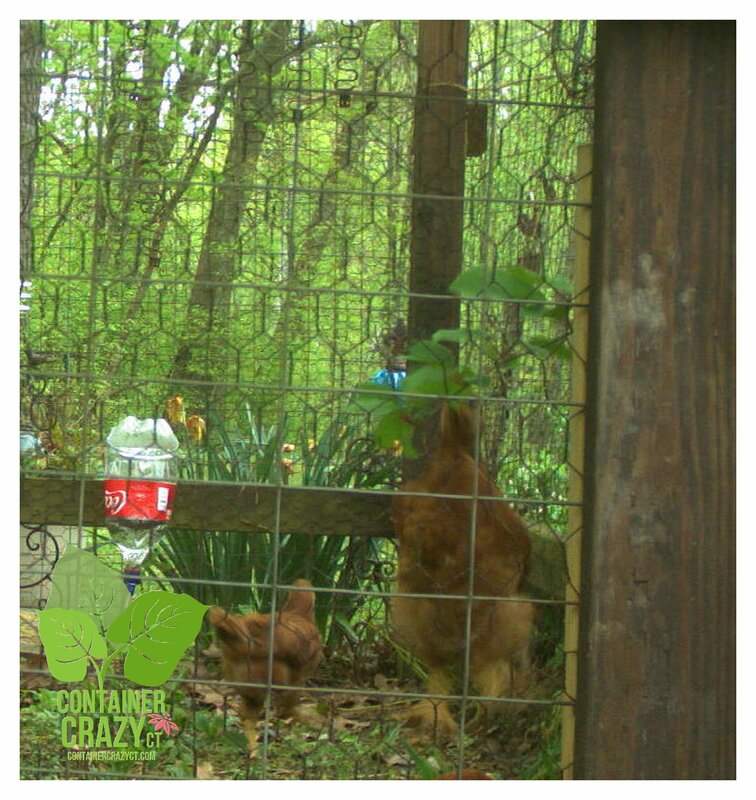 Since we have a motion censor camera, we set it up nearby to see what would lurk to investigate our new chickens. 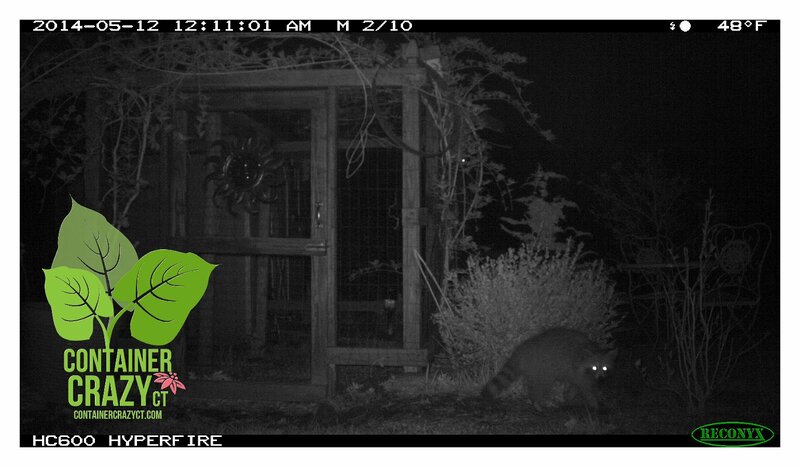 The first week, we spotted a raccoon and coyote in the photos, and one early morning, I saw a fox running around the coop with something in its mouth. Thankfully, it wasn’t one of my chicken. We are sure to close their coop door every evening, and we are keeping a steady watch to make sure their pen is safe. So far so good. 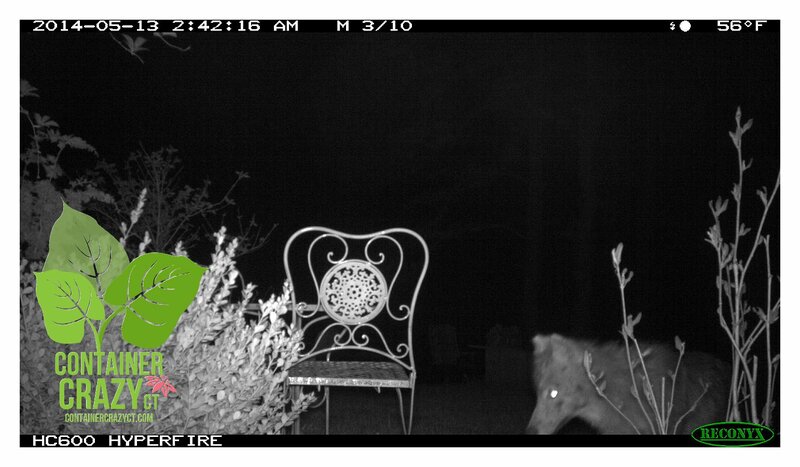 Kind of creepy to see the coyote checking it out. That’s all for goofing around with my camera. Now, its time to get back to work. 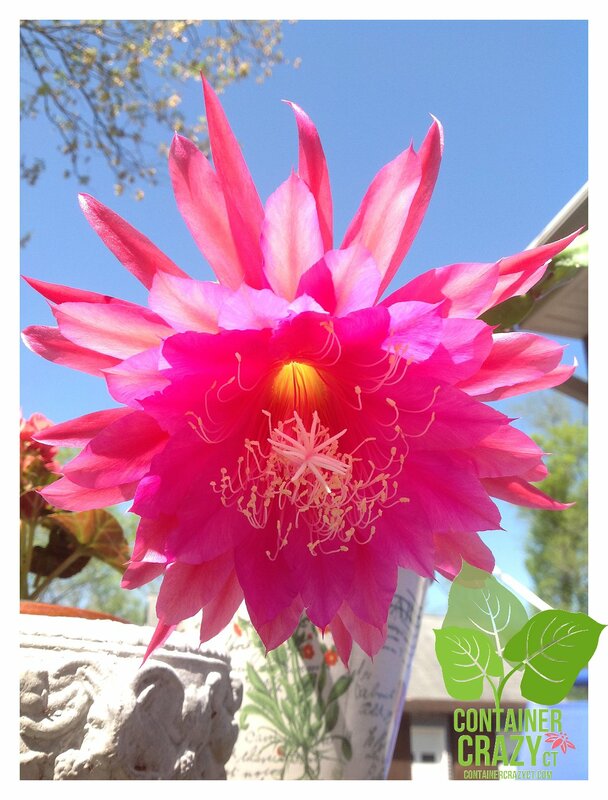 that pink cactusflower !! awesome ! Beautiful. Love those bright pots by your coop.